Since 2002, the United Nations has been dedicated to commemorating an annual international day of peace, observing this day as one of non-violence and global cease-fire. On the 21st of September 2015, in the year celebrating the 70th anniversary of the United Nations, this day was recognized under the headline of “Partnerships for Peace – Dignity for All”. 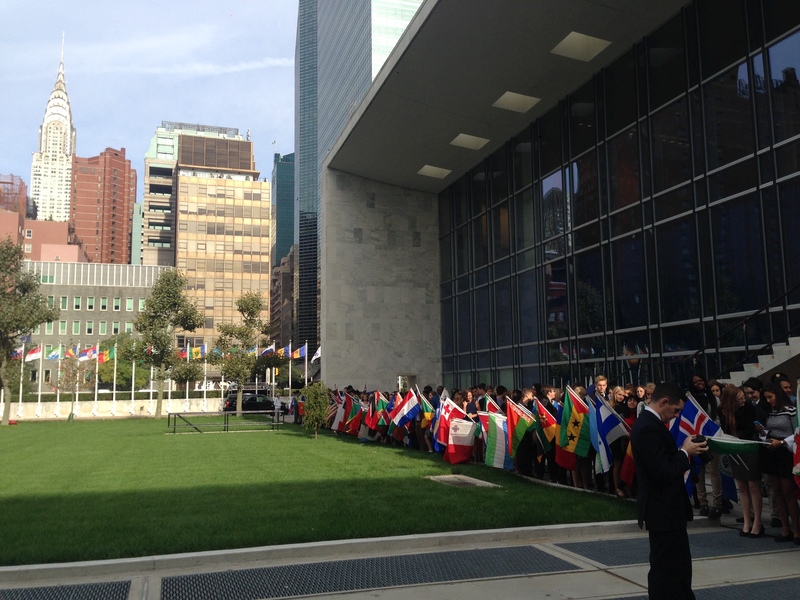 Like in previous years, activities taking place at the UN Headquarters in New York City included the ringing of the peace bell, a short message by the Secretary-General, a student video-conference, and a symbolic moment of silence at noon accompanied by another ringing of the bell. After being addressed by Secretary General Ban Ki-moon and General Assembly President Mogens Lykketoft at the peace bell ceremony, students from various schools and organizations around the world migrated to a UN conference room to hear words about how peace could be achieved, delivered by UN Messengers of Peace Jane Goodall and Michael Douglas as well as jazz musician and UNESCO Goodwill Ambassador Herbie Hancock and UN Youth Envoy Ahmad Alhendawi. This routine had brought a community together and raised an important issue, but what did the ceremony really achieve? UN Messenger of Peace, Jane Goodall. Photo by United Nations Photo on Flickr Creative Commons. While the schedule did allow for a question and answer period with the speakers mentioned above, only two or three questions were answered, surely leaving many disappointed by the missed opportunity to instigate a real discussion among top intellectuals and celebrities. Instead, event organizers found it necessary to spend time on more mundane things (although quite entertaining) such as a cello performance by famed cellist Yo-Yo Ma and a demonstration of Taekwondo choreographies by the World Taekwondo Federation. A similar pattern took place during the conference set out time for a presentation by students in Lebanon on site of the United Nations Interim Force in Lebanon (UNIFIL), who attended the conference via video. These were students who joined the UN in its call for peace by emphasizing the roles of UN peacekeepers and recounting their personal experiences in a region where war is a reality. New York-based participants also had the chance to present some of their peace projects, which aimed to show other students the importance of small steps of action to instigate bigger change, and although these individual were telling the overall message of the conference, they retained an aspect of “entertainment of the crowd”, as shown by the inclusion of a skit and martial arts choreography in the UNIFIL presentation. Although some might argue that this entertainment aspect was due to the rather young age of the crowd (most of the students in New York seemed to be of middle school age), this argument does not wholly justify for the lack of active academic participation in what is meant to be a deep educational encounter with the UNIFIL students who must have had much more insight to provide. UN Messenger of Peace, Michael Douglas. According to resolution 55/282, dating back to 2001, the universal day of peace should be observed on September 21st as a day of “commemorating and strengthening the ideals of peace both within and among all nations and peoples” as well as “an invitation to all nations and people to honour a cessation of hostilities for the duration of the Day”. Over the years, each day of peace was marked by diverse activities occurring at the UN Headquarters and in various locations around the world. In 2007, Ban Ki-moon demarcated his first peace day by introducing the idea of creating a specific topic for the day, which was alternated every year. In 2007, this was “Peace is the United Nations’ highest calling”; peace was, in fact, the primary goal in mind when the United Nations was created in the aftermath of World War II, with a goal to “save succeeding generations from the scourge of war“. For the first time, the UN provided ample information regarding what it was actively doing in its attempt to create global peace: peacekeeping missions, preventive diplomacy, pushing for diplomatic agreements, organizing meetings and debates among world leaders, etc, thus demonstrating significant progress in the educational goals of the observation day. In the past five years, the conferences have put increasing focus on the importance of youth in development and the increasing need to include sustainability in development, as shown by the 2012 Peace Day focus on the Rio Sustainable Development Conference and the “Future We Want”. It is thus making a progressive change towards the involvement of younger generations to push for a kind of world, in which new issues are prioritized and people with new mindsets are put in charge. If this is the ultimate goal, why not involve them in the discussion today? The Global Student Observance serves to educate those attending about significant issues of peace in the world today, ranging from human rights, youth education and sustainability, to nuclear non-proliferation and disarmament, refugee rights, and the use of diplomatic relations to end or avoid war. The conference also serves to unify groups and students from around the world, teaching them about the effects of war as well as create an atmosphere of solidarity. Although the day is successful in the organization of a symbolic ceremony made to inspire students and unify the world, this remains somewhat ritualistic. The ringing of the peace bell, the flag ceremony taking place at the conference, the moment of silence… all these are meant to achieve peace but are all symbolic by nature. Leaders such as Ban Ki-moon and the General Assembly President agree that this day marks a bittersweet situation, as the day observes many attempts to keep peace but also serves as a reminder of the never-ending conflicts happening around the world, which seem to be multiplying every year. 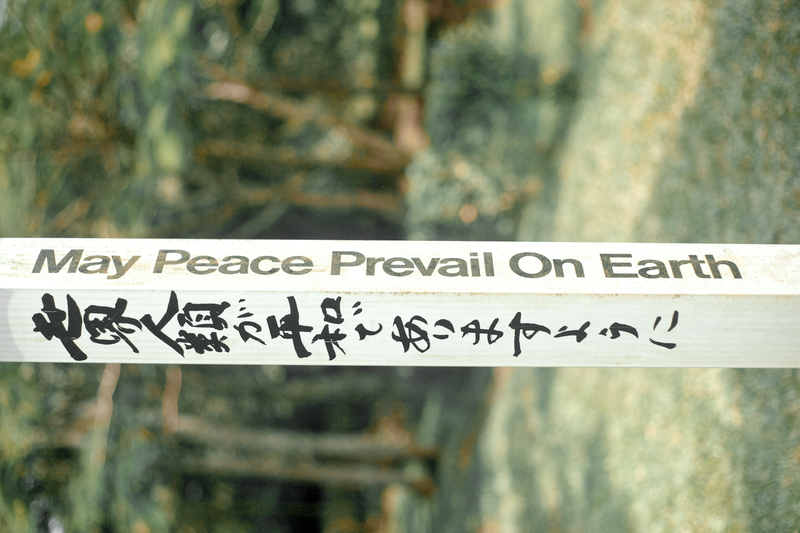 The resounding quote “May Peace Prevail on Earth” gives a heartwarming message but does not accomplish much by itself. In conclusion, it was apparent that some of the time set out for the conference could have been put to better use, such as creating a discussion among students and with UN members present at the conference. By looking at the backgrounds of most of these young people, it was clear that many or all were interested in finding a solution for peace, and a conversation between them might have lead to some interesting points for the future. As Youth Envoy Ahmad Alhendawi said himself, “we must strive to see youth as [peacebuilders]”, to which I might add, “not simply as observers”. Note: The author attended the “Partnerships for Peace – Dignity for All” conference. Information on this event is drawn from her experiences there. Alix Vadot is a U3 International Development Studies and Psychology student at McGill University. She hopes to go on to graduate school to study in law-related subjects or international humanitarian aid. She also wants to incorporate psychology in her studies of international relations and development. Originally from France and having lived in the U.S. for 9 years, she is an avid traverler and is looking forward to discovering what country she will be in next!